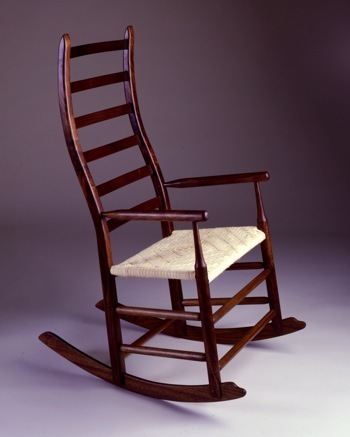 A favorite rocker because of its comfort and Maine history. Nan Kolias, the Yarmouth Town Librarian for many years was born and grew up in Brownfield, Maine. She had several of these rockers in her home and provided me the brief history that they were made by the men in Brownfield who worked in a local mill as ancillary work in the winter months. The back chair posts were curved by the steam bending process from straight stock and the rest of the chair parts were generally turned on lathes. What took my eye immediately, was the curved rear post - which provides a comfortable back to a normally uncomfortable New England ladder-back chair. Part of the comfort also comes with the steam bent horizontal slats of the back, which provide good support and “spring” in the chair. I don’t steam bend the rear chair posts as the originals are made of because I don’t work in green wood - rather, I band saw the posts from matched lumber. These chairs will last a lifetime. When rockers wear out (as they should with good continued use), they can be replaced by pulling the “pins” from the chair legs and inserting a new set - just like they did centuries ago. If you wear the rockers out and I’m still around this world, I warrant a free replacement set.